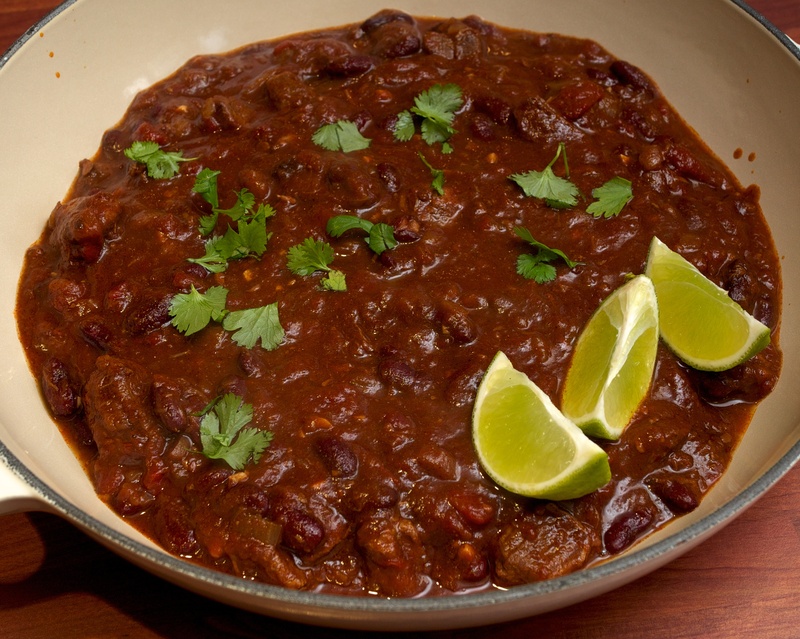 This recipe uses a couple of cheat ingredients (kidney beans in chilli sauce and chipotle paste) with great results – very little effort but tonnes of flavour! Wine Suggestion: We’d go for something juicy, fruity and red. Perhaps a Spanish Garnacha or a lighter Zinfandel where the tannins aren’t too high and dry and won’t conflict with the heat in the chilli. Heat a couple of tablespoons of oil in a large pan and cook the beef pieces until browned all over. Remove with a slotted spoon and set aside. Add the onion to the pan and cook until softened. Add the garlic, cumin and chipotle paste and cook for one minute. Sieve the kidney beans but reserve the sauce. Add this sauce, along with the tomatoes and a can full of water, to the pan. Stir well and return the meat to the pan. Bring to a simmer, then cook covered for about 2 hours or until the beef is tender (you can also bake in the oven for 3 hours at 160C/140C fan/gas 3). Add the kidney beans and lime zest, season and warm through. Serve with the coriander leaves, lime wedges and rice.